UPDATE – VOTING HAS BEGUN! You can vote for your favorite entry on our Facebook page! We’re hosting another art contest! This time it’s for the upcoming Suicide Quad movie. Create your best Suicide Squad art and submit it before July 10th for your chance to win a prize package including sneak preview passes to an early screening of the movie! Prize packages will be awarded for age brackets 13-17 and 18+. 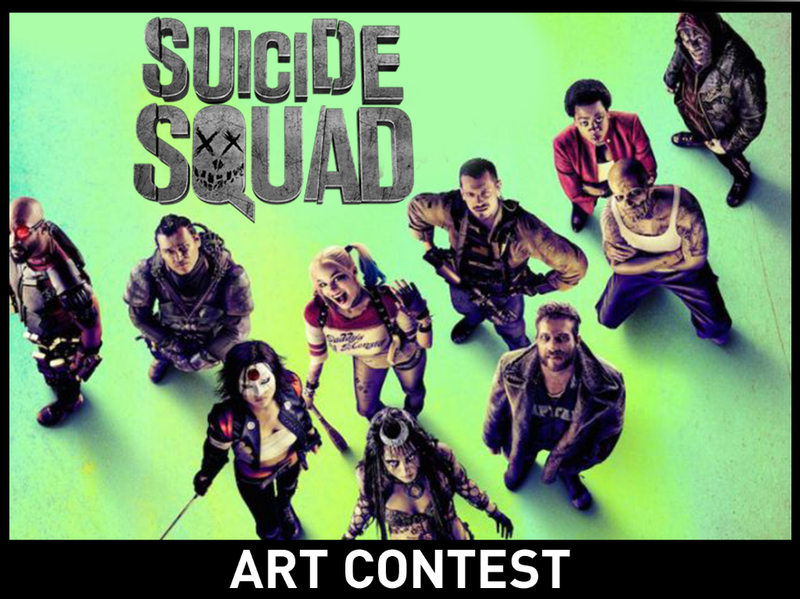 To enter, first create your Suicide Squad artwork. It can be a drawing, painting, sculpture, song, costume, or whatever you can make. Be creative! Then email your submission to suicidesquad@slackers.com by July 10th 2016. Be sure to include your name and age, as well as a phone number where we can reach you. Submissions can be sent as an email attachment or as a link. If you make a sculpture or other physical media, feel free to include pictures from a few different angles. Voting will take place on Slackers’ Facebook Page.